Understanding Addition has never been easier. 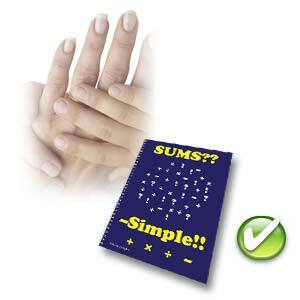 Buy your copy of Sums??–Simple!! for just £9.99 + postage and prepare to become a confident calculator! Being able to add-up correctly is an important skill in every-day life, and if you find that you regularly run-out of fingers when you are counting Sums??–Simple! !, the easy-to-understand maths book, is now available to lend a hand. In plain English, Sums??–Simple!! walks you through the process of adding-up, not just by demonstrating how it should be done, but also by explaining why it's done the way it is. Understanding the reasons for certain maths processes often helps learners in their overall grasp of the subject. Sums??–Simple!! the maths book to support elementary maths teaching from primary level covering Key Stage 2 and Key Stage 3.